This is a tricolour 50 rose bouquet which is a best way to impress your loved ones. Make them yours in a heartbeat. Send this luxurious gathering of double shaded carnations elegantly hand-crafted. Basket arrangement of 12 double shaded carnations and lot of green fillers and Arica palm leaves. Suitable as a gift for birthday, anniversary, wedding, valentines or to just say thank you. A big beautiful bunch of 50 roses. Sure to make a happy occasion happier! - 50 Roses with decorative ferns. - Wrapped in clear cellophane or color paper, depending on availability. 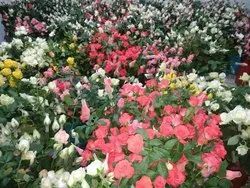 We are recommended by the clients for offering a quality tested array of Fresh Rose. The Fresh Rose we offer is available in various packaging. Our Fresh Rose is known for its rich fragrance and freshness. Moreover, one can get these products in give time bound that can be purchased as per the requirements of the clients.